Susan Knapp and Mary Jane Mattingly really enjoy quilting and designing; their patterns are proof! Many have elements of traditional blocks and some include a twist or two! In this Fireworks table runner, star blocks are modified and made to look like fireworks. Get ready for your summer parties and picnics. The pattern also includes instructions for placemats. Blocks of large spools of thread are alternated with four square blocks of smaller spools of thread and squares of sewing notion fabrics. The thread look is created with striped fabrics – isn’t that clever?! Finishing at 49″ square this quilt is just right for hanging in your sewing room or gifting to your friend who loves Just Spoolin’ Around. Six Halves Make A Whole is the first book in a line of books that make use of those beautiful bundles of six half yard cuts. Or make your own bundle of fabric. This particular book has patterns for six projects, so you get a lot for your money! Table Topper Series #1 Spring includes patterns appropriate for March, April and May. The Series is complete and has patterns for each season. Change your table topper and your mood each month! Check out The Quilt Branch page for lots of wallhangings, lap quilts and a few bed sized quilts, plus table topper patterns. Feel at home with familiar blocks and the same time feel energized by the new life they breathe into them. Claudia has been sewing nearly all her life. She was making her own clothes by the age of 12, so I wonder how old she was when she actually took her first stitch! Claudia’s patterns aren’t just for quilts. She has several purse and bag patterns. I hate to pick favorites, but isn’t this just the cutest?!?! Texture Magic gives those flowers some texture and makes them pop. You’ll love carrying this Lizzie bag around. Here’s a great idea. The Quick Change Bag pattern is for a reversible bag with a separate lining. Pull out the lining, reverse the bag, replace the lining. Ready to go! And Claudia’s patterns aren’t just for cotton. Her “Yard” patterns are table runners of beautiful flowers. They are designed for wool, which gives a beautiful three dimensional quality to the finished piece. Hand embroidery and beading create additional interest on A Yard of Roses. This quilt measures 10″ x 36″ when finished. But, never fear, Claudia DOES have quilt patterns too. And not boring, same old same old patterns. Her quilt patterns are not each like the other. Some of them are bold and graphic. Sunflower Farm is a good example. The design is striking, yet fairly easy to construct. Four basic blocks and some simple applique… before you know it you’ll be snuggling under this quilt dreaming of Spring. Ramblin’ Rose is another one of the bold, graphic designs and I’m excited to be making it over the next couple weeks…. I’ll share progress with you. 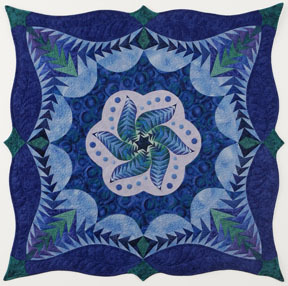 And then there are the beautiful, gently graceful quilts, such as Morning Star. Flowers in varying shades of purple flow across an ever so subtle pieced background. Before adding the beads to embellish the flowers it might be fun to do a little free motion quilting on the flowers and leaves. So there’s a peek at a bit of what Claudia Atchison is all about. Be sure to check back with us over the next two weeks. We’ll be posting an interview with Claudia and some pictures of where she creates, there will be progess on Ramblin’ Rose to report, we’ll look at some more patterns, and of course a giveaway! Winner! and Chit Chat Quilt is finished. The winner of the three patterns from Prairie Sky Quilting has been chosen, from all the comments left, by a random number generator. But first …. I hope you all enjoyed our time spent with Prairie Sky Quilting. I know that I am hooked on the Fun & Done! patterns. The Chit Chat table runner is finished and it went together very quickly. The instructions were clear and Susan gave lots of little tips for making the entire process go smoothly. The table runner called for 12 blocks but I needed one a little smaller so I only used 10. It really was Fun & Done! A Batting Buddy with help with fabric and batting placement to make the process even easier and faster but it is optional – I didn’t use one, but I do love my quilting tools so I see one in my future. Okay, back to the winner. It was Katie Mae Petross, a Facebook Fan. Enjoy your patterns, Katie! In this part of the interview Susan tells us about her daily life as a quilt designer. What is your favorite part of the quilting process? I’ve come to enjoy so many parts of the quilting process as I’ve expanded into designing. Today’s software technology has made designing quilts so much fun, and easier than the colored pencils and graph paper that I started with! I use EQ7 for my patterns, and CorelDraw for my show quilts. But, I love to sew, and need to do it regularly. Sewing is how I relax and recharge, but there are never enough hours in the day to sew as much as I would like. I so agree about there not being enough time each day to sew and I’ll bet our readers feel the same way! Susan, can you tell us what a typical work day is like? I began this career when my youngest child started school. I was still a full-time mom, and I started teaching quilting on a limited basis. My business grew gradually as I had more time to devote to designing, teaching, and eventually the pattern business. Now I have 2 daughters in high school and a son away at college, so I’m glad to be home and available to them as needed. I spend a lot of time on things that aren’t very creative or quilt-related, like packing orders, bookkeeping, and keeping up with emails. My design and sewing times vary based on the demands of my current deadlines. No two days are alike, and most days don’t go as planned. It’s always a challenge to juggle the many responsibilities of work and home life, but I appreciate the flexibility that I have to keep the balance that works best for me. As my business has grown, so have the demands of maintaining inventory levels on multiple items. Prairie Sky Quilting has taken over other parts of our house and garage. As my kids have grown, I’ve moved toys out of the closets, and taken over that space for patterns. But I do dream of having more room, so maybe when the kids move out, I’ll take over the whole basement! When you are starting a new project, what comes first for you – the design or the fabrics? I usually start with the design, then look for the fabrics that work best for that design. Finding the right fabrics can be very challenging, especially finding the right combination that will photograph well for a pattern cover. My stash is evidence that my original plan doesn’t always work, and I need to revise the plan and buy more fabric. When choosing fabrics, I often start with a focus fabric, and pick colors to coordinate with that. Do you have favorite types of fabrics? I tend to like more contemporary fabrics and vibrant colors. As a pattern designer, I try to use a variety of styles that might appeal to a wider audience of quilters, so that challenges me to stretch my comfort zone. But it always has to be something that I like, because I can’t do my best work if I’m not enjoying the project. Thanks for sharing with us Susan! Recently Susan Nelson, the designer of Prairie Sky Quilting‘s patterns, answered a few questions for our inquiring minds. How did you start your adventure with quilting? Did someone mentor you or influence you? I started sewing at 10 years old, making garments. I went on to do tailoring and alterations during college, while I majored in Textiles & Clothing. Several years later, my first quilt was a Trip Around The World design, made for a full size bed. With my sewing background, I was confident in being a self-taught quilter. Looking back, it think that was not a good decision, and I should have taken classes! I traced 2″ squares around a cardboard template and cut them out with scissors. (Having started my quilting endeavors with all the latest tools I can’t imagine making any quilt with cardboard templates and scissors. And then to think you tackled a full size Trip Around The World! You are brave!) It’s no surprise that after that experience it was a few years until I got back into quilting. Like so many quilters, I was motivated by the birth of my first child, since every baby needs a quilt! I made a smaller version of the Trip Around The World design. And this time, used a rotary cutter and strip piecing. I have been hooked on quilting ever since then. There is no one in my family who quilted, and I’m still the only one! I have two daughters who aren’t interested in sewing or quilting, but maybe they will change their minds someday! We’ll keep our fingers crossed that someday your daughters will share your passion. It will probably coincide with the births of your grandchildren! So you were hooked on quilting…. what prompted you to start designing patterns? I was teaching at a local quilt shop, and was asked to teach a quilt-as-you-go technique. That particular method made beautiful quilts, but was very challenging for most quilters. I saw the appeal that quilt-as-you-go had for my students, and wondered if I could find an easier way. So, I experimented with some scraps for a while, and came up with an easy method. I showed it to the shop and other friends, and no one knew of anything similiar on the market. I named the method “Fun&Don!”, started teaching it at the shop, and went into the pattern business! Do you have a favorite type of quilting? One of the most appealing features of this art is its variety. I started quilting knowing that I would never be interested in hand work, but I soon changed my mind and became interested in hand applique. Now, I’m looking for a hand-piecing project that I can take with me on-the-go. I love classic piecing, paper piecing, hand applique, machine applique, and machine quilting. There’s always something new to learn, so it’s always interesting and fun! For my patterns, I look for easy methods that appeal to beginner quilters. But I also make quilts that I enter into contests, where I push myself to do very complicated pieces. I enjoy the challenge, and it’s been very rewarding to win a few prizes too! This is Swish & Swirl, one of Susan’s show quilts. You can see the rest of her quilts on her website – check out the Susan’s Show Quilts page. They are all stunning. Come back in a day or two for the second half of Susan’s interview. She has lots more to say! And don’t forget to comment on this post for another chance to win three Prairie Sky Quilting patterns! Read more about the giveaway at this post. Prairie Sky Quilting Pattern Giveaway! Fun & Done! Quilting Easy Diamonds Pattern is rated for beginners so it works for everyone. If you are more experienced this will be even quicker and more fun. Try out this easy technique that yields a quilted project when the piecing done. Bind the Fun & Done! way and you are finished! I can see this pattern in different shades of one color with black or white sashing… a great visual impact. Triple Expresso Hop, Skip & Jump quilt pattern gives you so many options. Just three different blocks – the same three different blocks if that makes sense :) – give three completely different layout looks. And as if that’s not enough, there are instructions for five different sizes: crib, lap, twin, queen and king. The Eye Catcher, also known as the Spectacle Receptacle, will hold your glasses so you know right where to find them. I need one of these. I spend (waste) so much time looking for mine! This would make a great gift too. Your rotary cutter or tv remote would also fit nicely in one of these. So, do you want these three patterns? You have until next Friday (January 21st) at 12:00 midnight (central time) to leave comments. A winner will be selected with a random number generator. One person will win all three patterns. Leave a comment (just one!) on this post. And for more chances to win, leave a comment on any other post made between now and next Friday. That’s right, each time you see a new post on our blog, leave a comment and you have another chance to win. Any comment on our QuiltersWarehouse Facebook posts (between today and next Friday) will also give you another chance to win. So let’s hear from you!